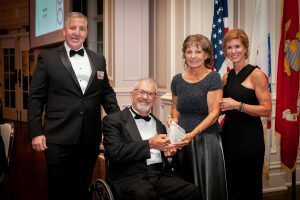 Nominated for being an avid supporter of service members, veterans and military families through his tireless work with Hope For The Warriors, Paul Kelly received the Vigiano Family Hope and Courage award at the ninth annual Hope For The Warriors’ Got Heart Give Hope Gala. Born into a military family at the Naval Hospital on Cherry Point, N.C., the military and military culture was a part of Paul’s life from the beginning. His education at N.C. State University led him to a 32-year career as a Supervisory Electronics Engineer for the Naval Air Systems Command (NAVAIR). Paul’s life changed when he broke his neck in a swimming pool accident shortly after college graduation. Leaving his lower body completely paralyzed and extensively paralyzed his upper limbs, the injury required hospitalizations and months of rehabilitation. Ultimately, Paul became dependent upon caregivers for assistance with all basic life activities. Despite his newfound challenges, he went on to lead teams and develop upgrades and modernizations of Navy and Marine Corps aircraft while working for NAVAIR. 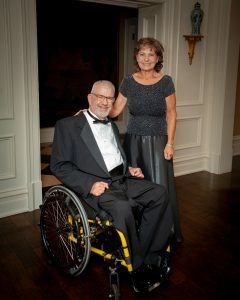 Serving as an advocate for the disabled, Paul promoted Department of Defense policies to transition wounded and disabled military personnel to civilian service. His efforts earned him the recognition of NAVAIR’s Supervisor of the Year and Department of the Navy Meritorious Civilian Service Award. Paul first witnessed handcycle marathoners as a spectator at the Marine Corps Marathon. Inspired and determined, he decided to celebrate his 30th year of living with a disability by competing as a hand cyclist at the 2008 Marine Corps Marathon. While training, Paul became aware of Hope For The Warriors and decided to use his marathoning effort to raise awareness and support for the military nonprofit. Over the course of the last decade, he has completed 54 full marathons, 58 half-marathons and one 100-mile ultra marathon across 18 different states. He’s completed over 35,800 miles in training, events and fundraising activities, and along with his wife, Sally, has raised over $86,000 in donations for Hope For The Warriors. Follow the Paul’s journey of sharing HOPE on their blog 2008 Miles of HOPE.